The Romsdalen Waterfalls page is where I’m clumping the various roadside or nearly roadside waterfalls that didn’t seem to have obvious infrastructure or literature devoted to the numerous waterfalls seen in the famous valley of Romsdalen. There were simply way too many to single out, and the dearth of literature pertaining to most of those that we noticed and photographed made it difficult to even associate or identify what we had seen. It was only after the fact that I started to piece together which of the streams or watercourses the waterfalls belonged to or which waterfalls we had actually seen. Yet even then, we only had a partial picture with a lot of gaps. 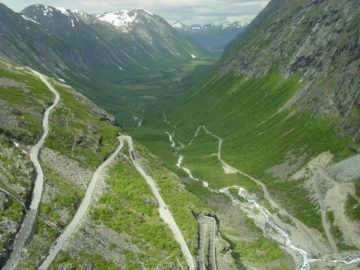 I’d imagine that most visitors driving through the narrow 60km valley (see directions below) would probably just experience the whole thing in a drive taking a couple of hours or so. 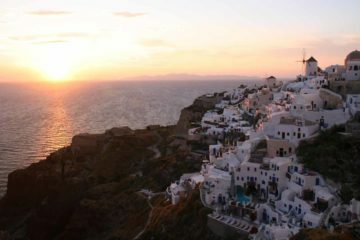 After a few stops here and there, they’d be apt to be satisfied with the overall experience. So we’ll treat the write-up of this page similarly by pointing out the waterfalls we did photograph and/or stop for with the more famous or obvious ones linked to separate writeups. 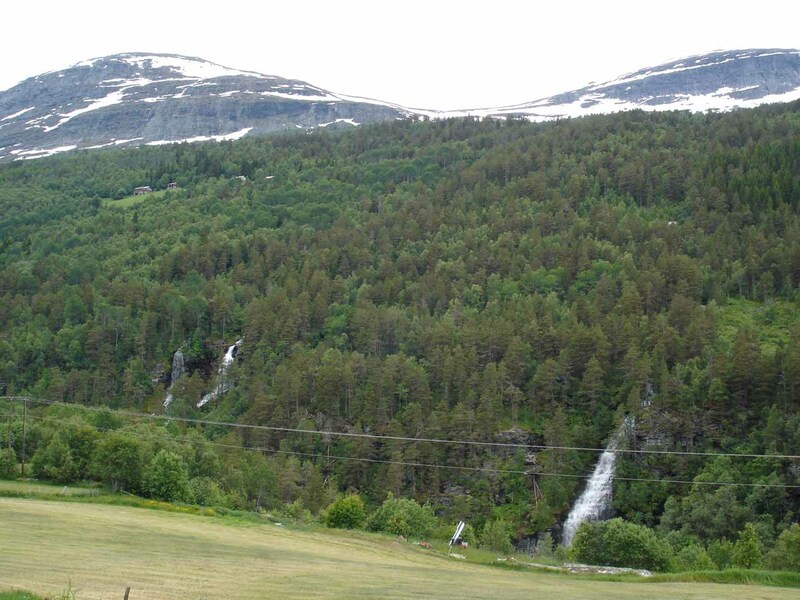 We begin with the first waterfall we encountered in the valley, which was “Kleivafossen” and Svaåafossen. 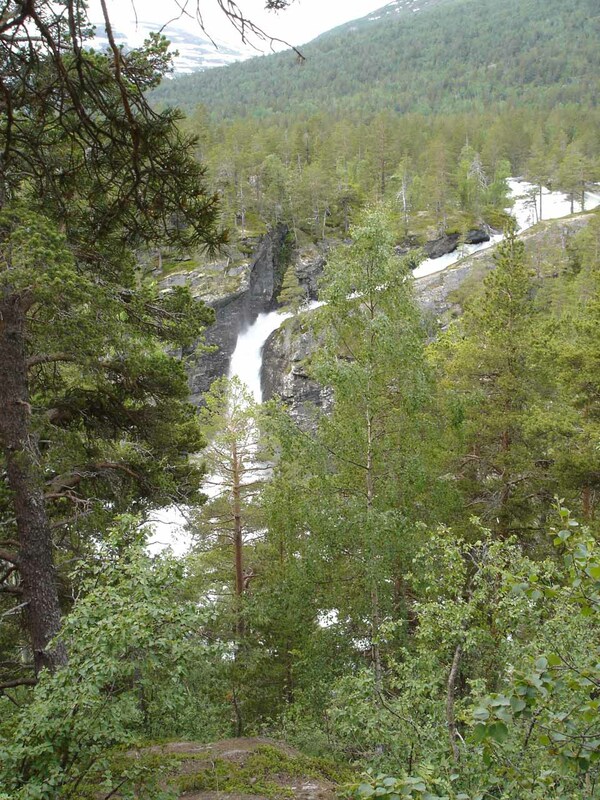 This one was actually a pair of converging waterfalls where the waterfall facing us (as you see in the photo at the top of this page) was on the Ulvåa Stream while the one in profile coming in from the left was on the Rauma River itself. 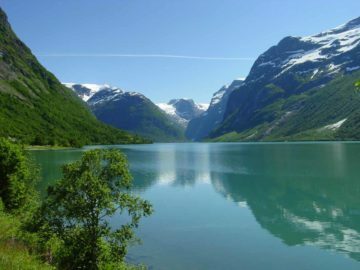 The Rauma River was the main river running through Romsdal Valley. 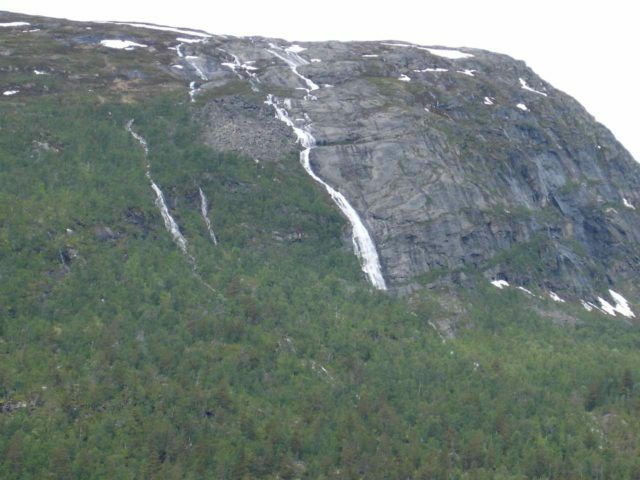 I informally gave it the name “Kleivafossen” because it was near the hamlet of Kleiva, but I swore there was an old Norgesglasset map that actually labeled this falls Kleivafossen. However, the later versions of the map (now Norgeskart) didn’t seem to have that placename (stednavn) anymore. In any case, Julie and I actually didn’t even notice this waterfall at first as we left Oppland County and started to get into the Møre og Romsdal County. 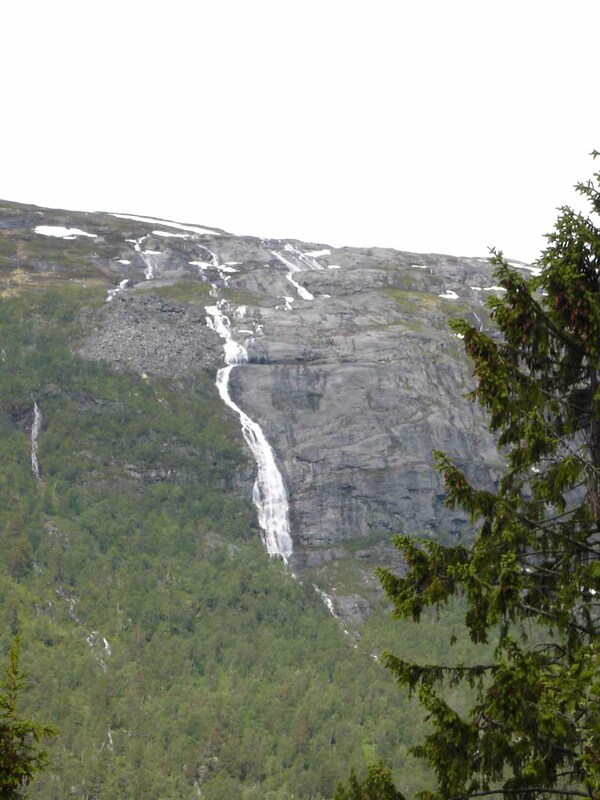 What got our attention was a more distant waterfall twisting down a tall cliff face, which we believed to be on the watercourse Svaåa. 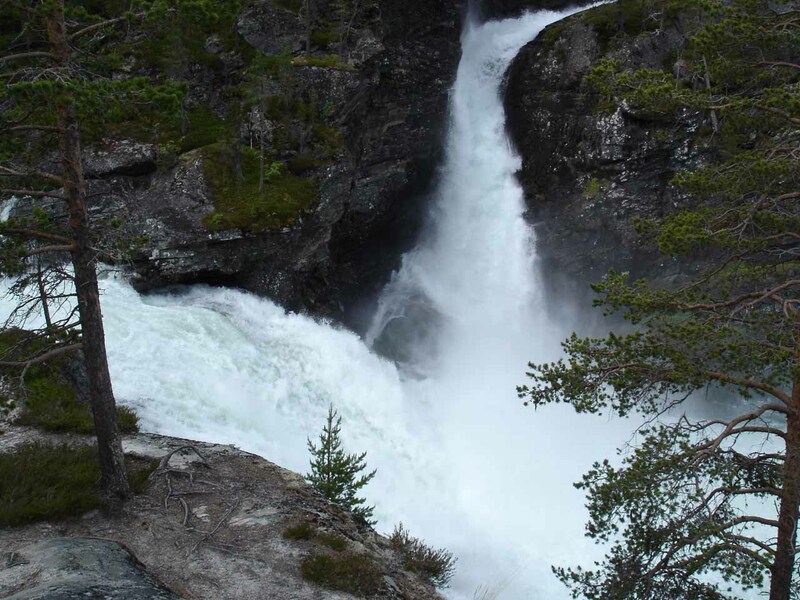 As we tried to get a better view of this waterfall, which we’ll call “Svaåafossen”, that was when we noticed right below us was what looked to be a loud and gushing waterfall hidden amongst the bush on the Rauma River itself. It was only after scrambling around in search of a better view did I find some use trails leading to the view you see at the top of this page. 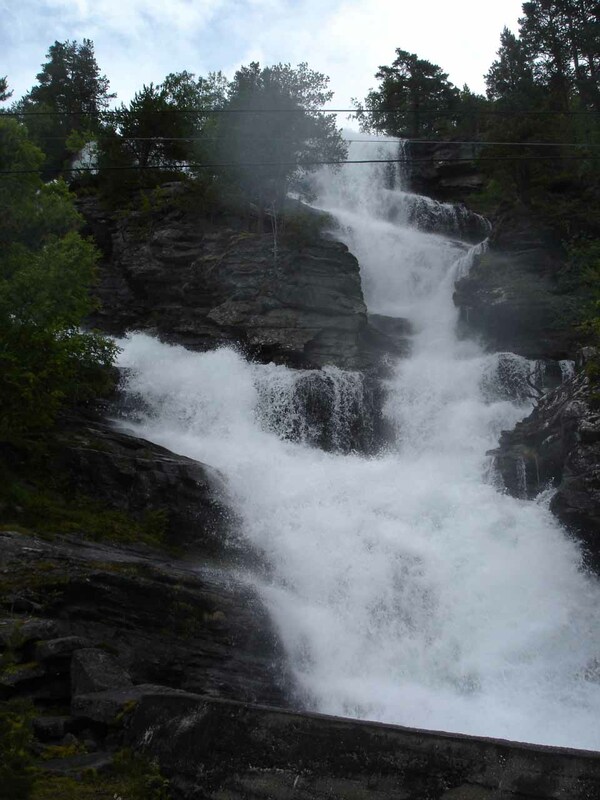 Speaking of “Svaåafossen”, that waterfall was no slouch either. 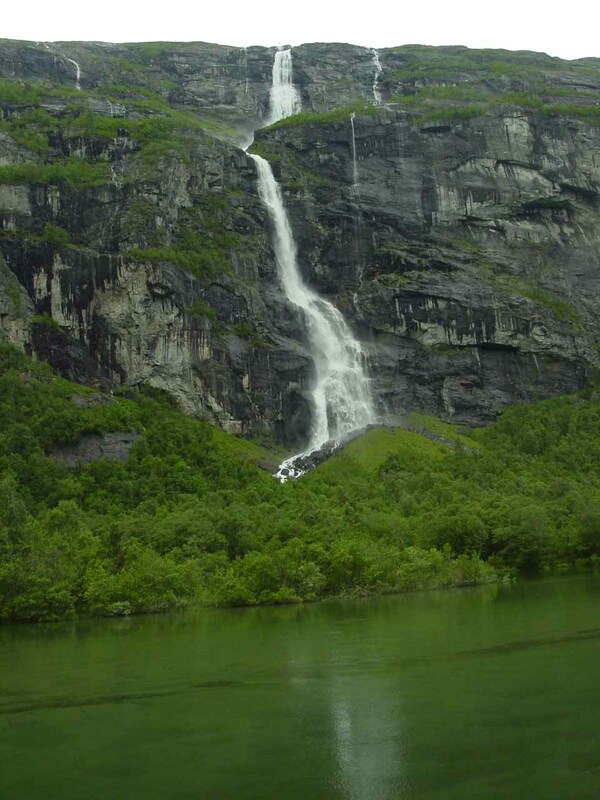 It looked very tall with some fairly significant volume so it seemed to be way more substantial than the run-of-the-mill tall ephemeral waterfall types that tended to be common amongst obscure waterfalls tumbling down steep valleys like Romsdalen. 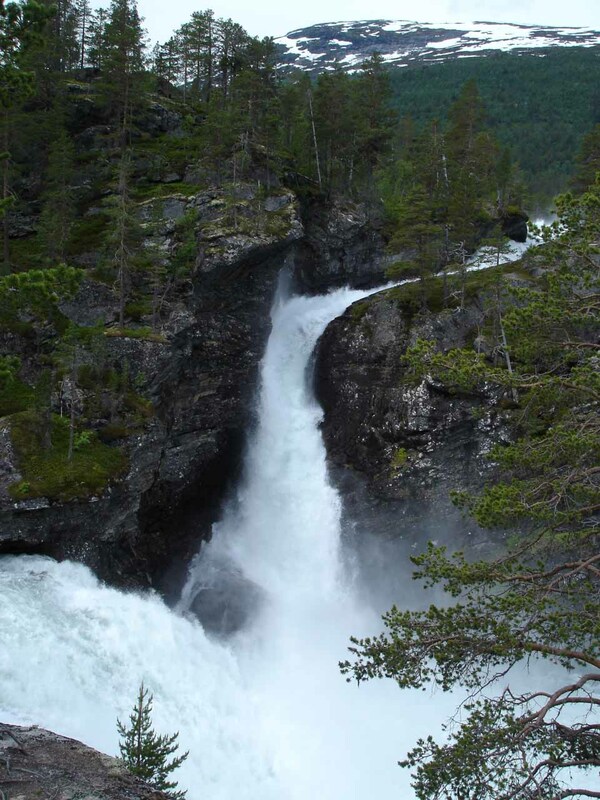 So I guess you could argue that Svaåafossen was the first waterfall we saw even though Kleivafossen was the easternmost of the waterfalls in Romsdalen that we encountered. 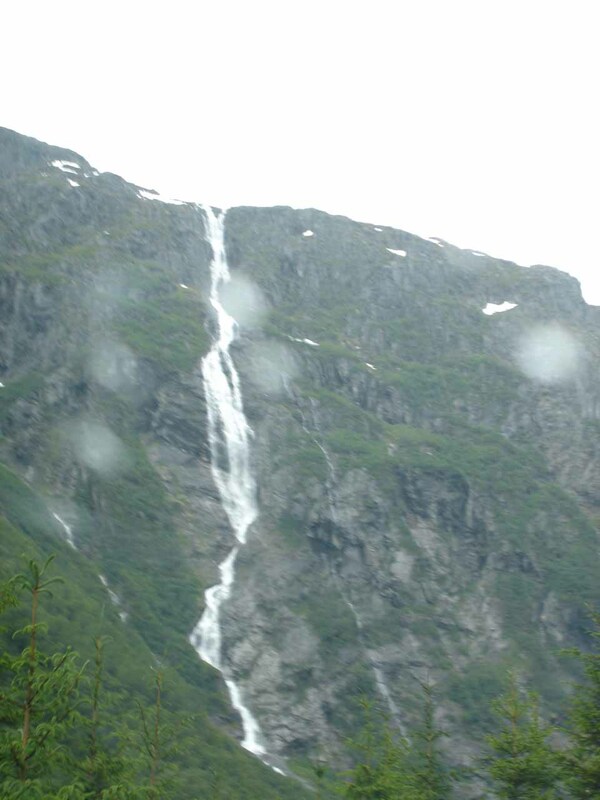 The next waterfall we encountered was near a turn on the way to Slettafossen. This particular waterfall was on what I think was the Raudåa Stream (“Raudhåafossen”?) by a road bridge on the E136 though I couldn’t avoid the power lines above. While this waterfall itself wasn’t particularly that interesting, I vividly remembered this place because there was another car making the turn before this road bridge that took the turn too fast and hit the guardrail while I was outside the car. It was a bit scary and fortunately I was far enough away that I didn’t get hit. That said, the driver seemed ok and the vehicle just had scratches and minor dents. 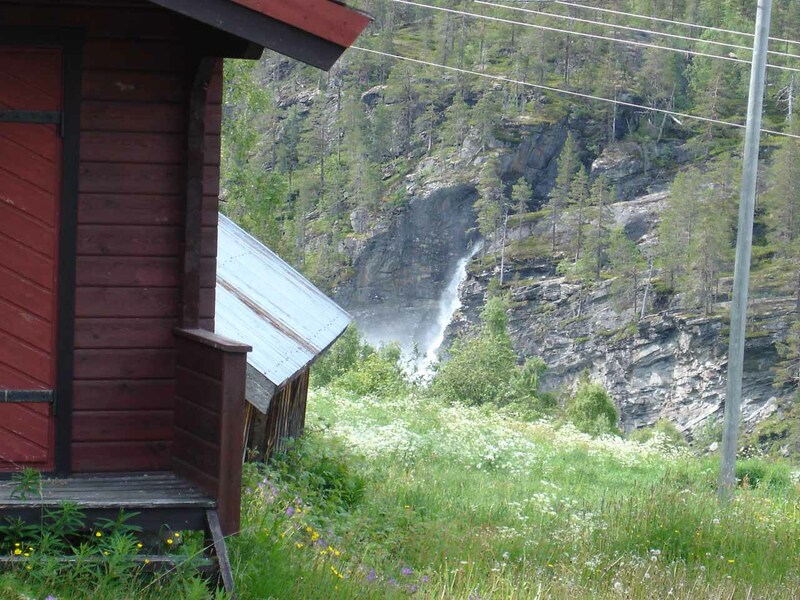 After the Raudåa Waterfall, Slettafossen was next, which we devoted a separate writeup to. After Slettafossen, the impressive pitchfork-shaped Vermafossen was next, but we also devoted a separate writeup to that intriguing waterfall. After Vermafossen, we then stopped for a trio of waterfalls called Døntefossen, Gravdefossen, and the unofficially named “Skogagrovafossen”, which were all across close to each other. We devoted a separate writeup for these waterfalls as well. Next, the waterfalls started coming in waves and we started losing track of them. 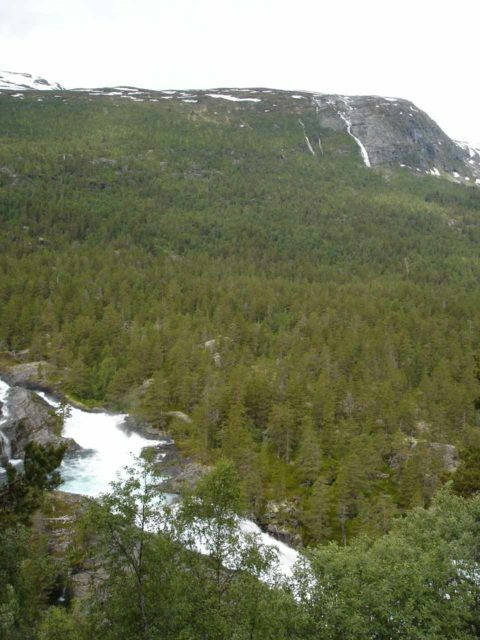 At this point, I recalled we were looking for the waterfall Mongefossen, but we couldn’t find it because its watercourse was completely dry due to a dam blocking its watercourse. There were other waterfalls we did notice where we thought Mongefossen was supposed to be, but they seemed to have neither names nor some form of notoriety. So our drive into what turned out to be a very dramatic part of Romsdalen continued as we encountered the next notable waterfall, which we believed to be called “Ølmåafossen” since it was on the Ølmåa Stream. The reason why we noticed this one was that it was very tall and seemed to have pretty significant volume. 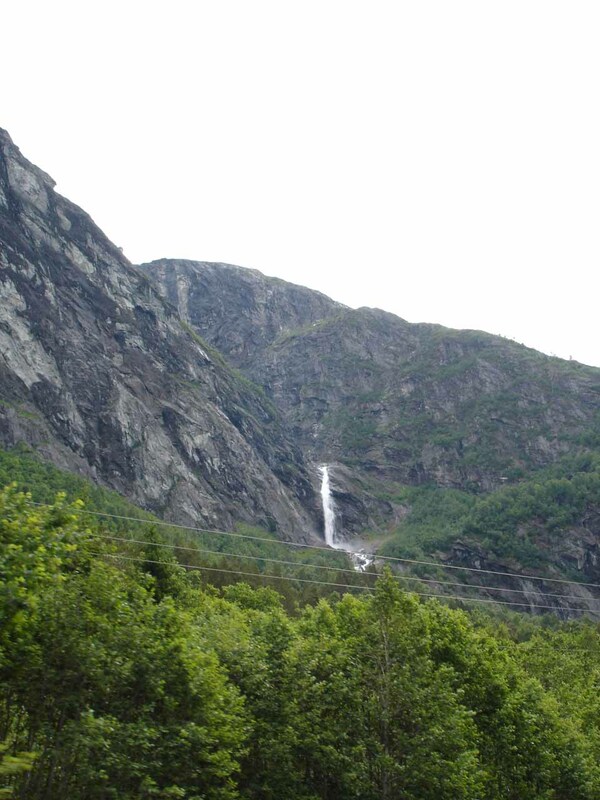 Since the E136 highway was going straight towards it as we were heading west, it was a waterfall that we couldn’t miss. 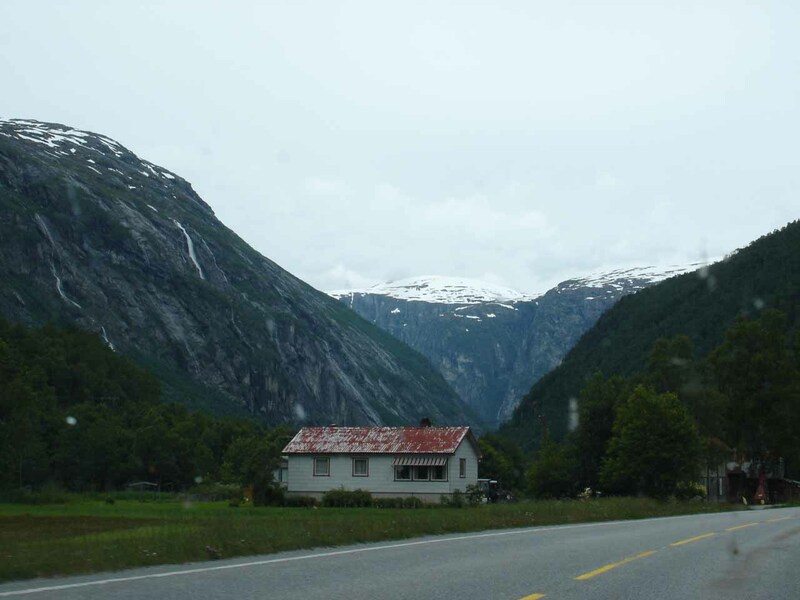 Julie and I didn’t stop for it so Julie used her point-and-shoot camera to take photos of it through the car windshield as I continued driving deeper into Romsdalen. 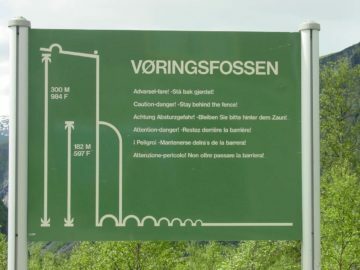 Just beyond Ølmåafossen, that was when we got into perhaps the most dramatic part of Romsdalen, which was where the vertical walls of Trollveggen was. Atop Tollveggen were the peaks of Trolltindane, which was said to be where trolls were turned to stone. 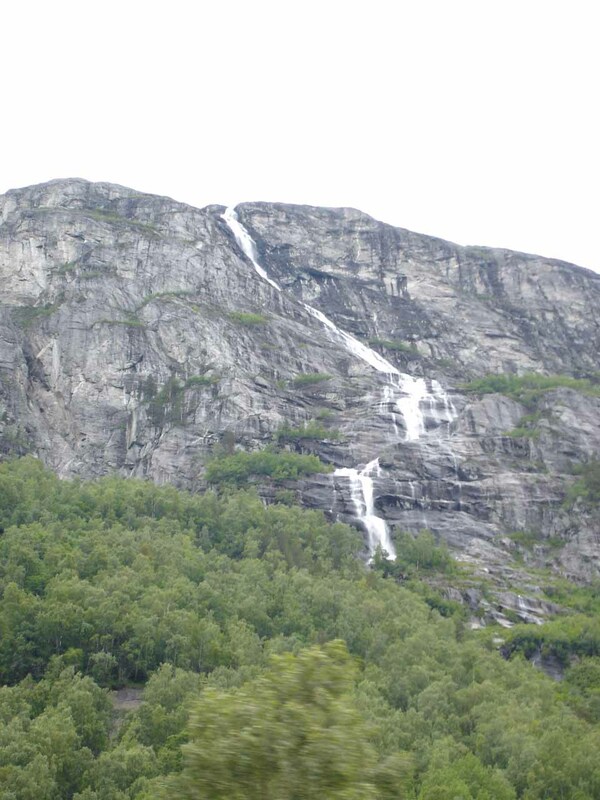 Apparently, Trollveggen’s uninterrupted 1000m sheer wall was a well known rock climbing challenge, and I could see why this combination of waterfalls and sheer granite walls sparked comparisons of Romsdalen with Yosemite Valley. 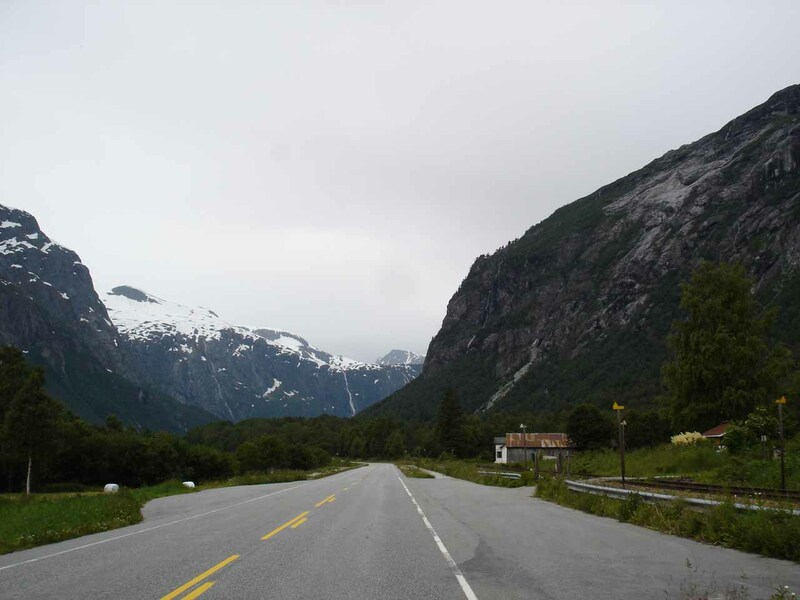 Beyond Trollveggen, we continued north on the E136 past its junction with the Route 63 (which ultimately headed west towards Trollstigen or “the troll ladder”) eventually towards the town of Åndalsnes. 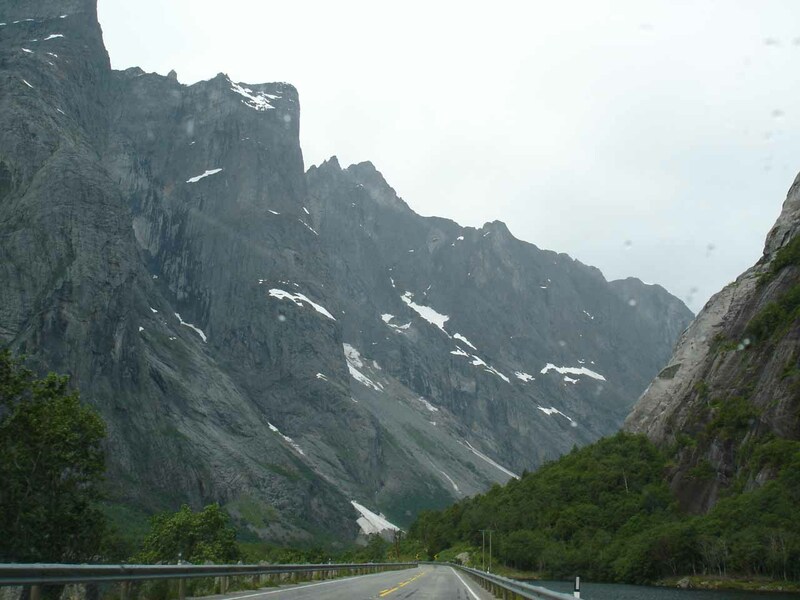 In this stretch of highway, the scenery was less dramatic than the Trollvegen vicinity and so we knew that this pretty much concluded our Romsdalen auto tour. 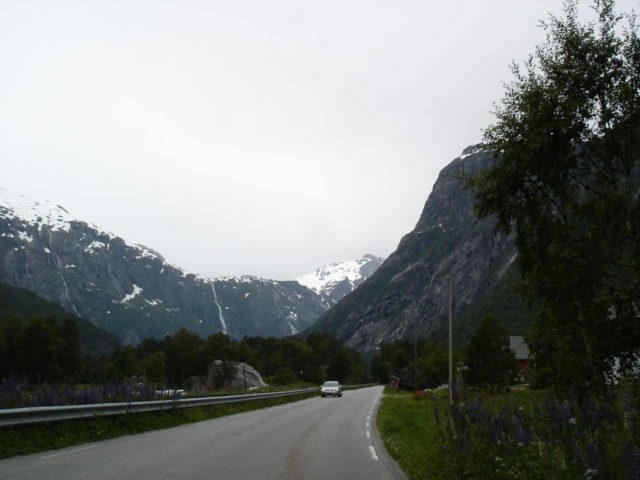 This page covers the stretch of road along the E136 between Bjorli and Åndalsnes. 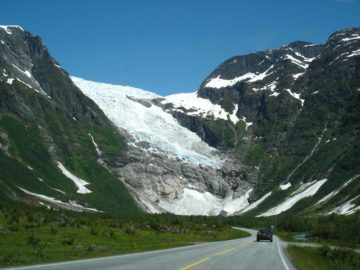 We started our drive from Dombås (in Oppland County), and we drove northwest on the E136 highway where Bjorli (near the border of Oppland and Møre og Romsdal counties) was about 56km northwest of Dombås. Kleivafossen was about less than 6km northwest of Bjorli on the west side of the road. What we ended up doing was we made a U-turn at a pullout next to a red house (around where Svaåafossen was visible from the E136), then headed back south along the E136 looking for the next pullout to our right. 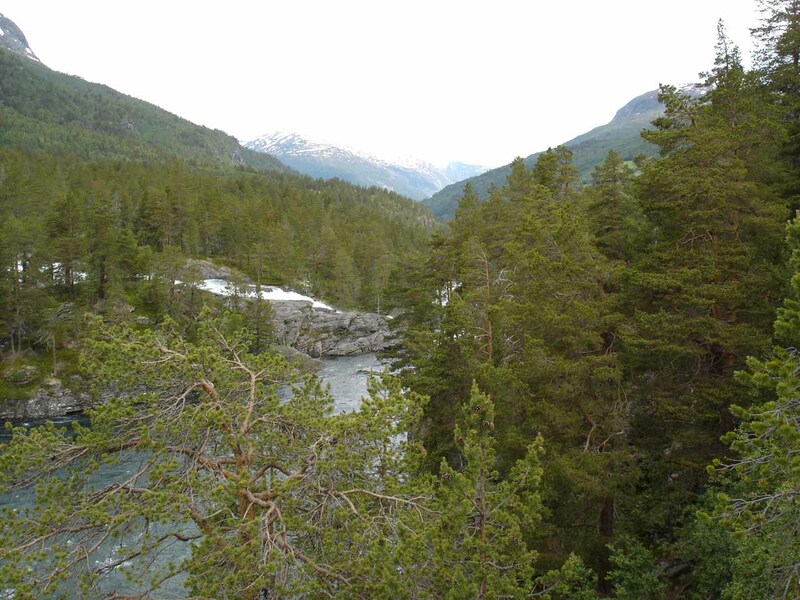 Once we got to that pullout, that was when we found some unmarked walking trails leading to closer and unobstructed views of Kleivafossen. 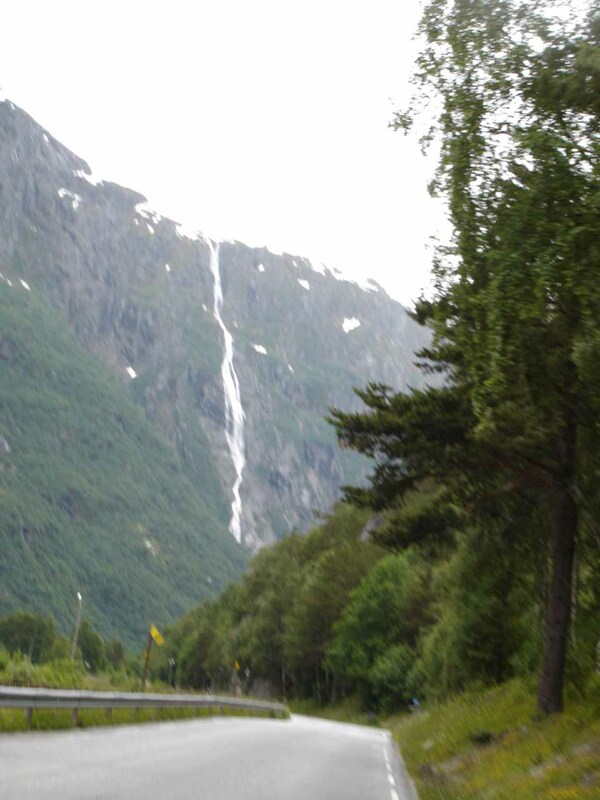 The next waterfall (“Raudåafossen”) was roughly 3km further northwest on the E136 on the right side of the road (east). This was the one near a bridge just past a turn with guardrails (where I witnessed a little car accident as it happened). 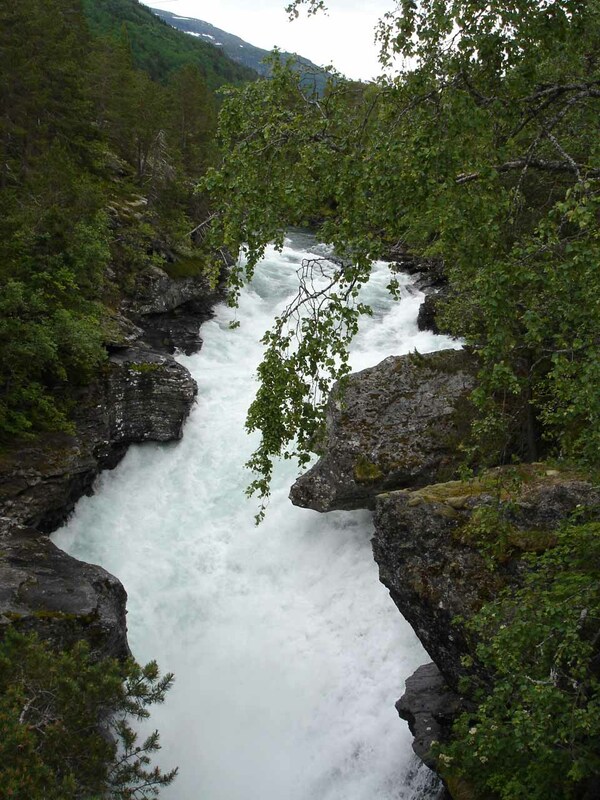 The well-signed Slettafossen was another 1.6km further northwest on the E136. 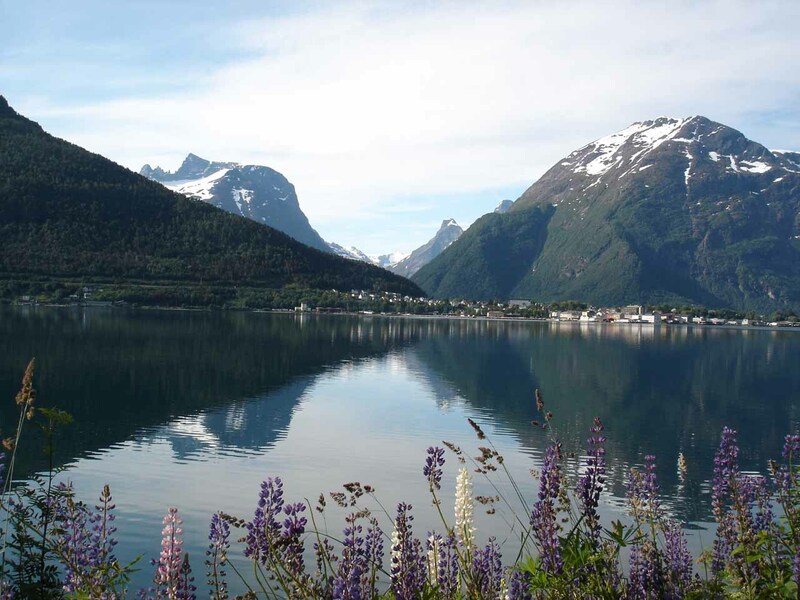 Another 3.2km further northwest on the E136, we found a pullout affording us a nice view of Vermafossen, which was just past the village of Verma. 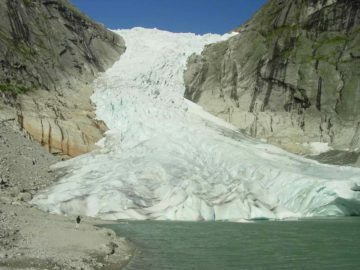 Roughly 6.3km northwest on the E136 from Vermafossen, we then encountered some pullouts and shoulders around the unsigned waterfalls of Døntefossen, Gravdefossen, and “Skogagrovafossen”. 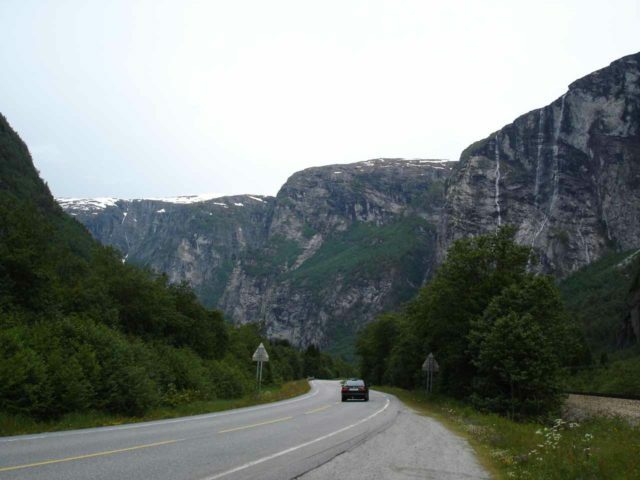 I recalled that after pulling out somewhere across from Døntefossen, we were able to walk along the shoulder of the E136 highway to see both Gravdefossen and “Skogagrovafossen”. However, we had to cross the highway to get closer to Døntefossen across the Rauma River. 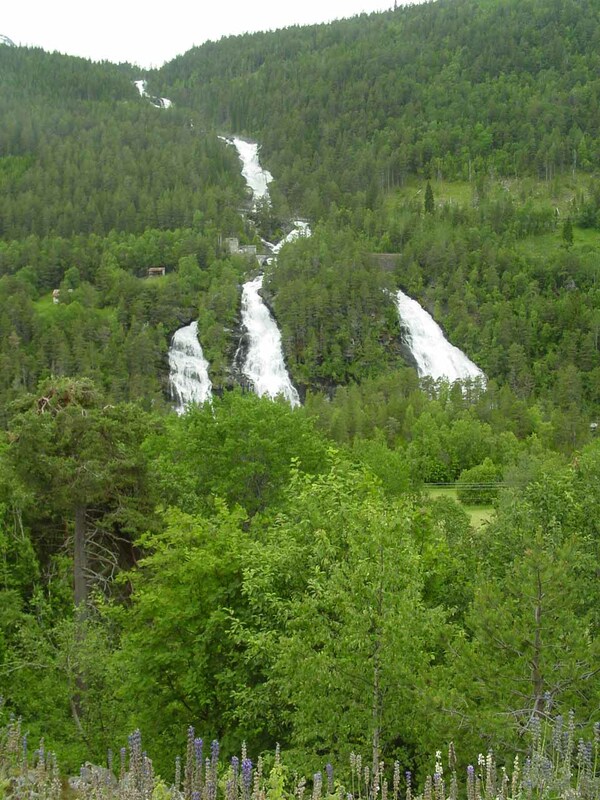 After this trio of waterfalls, we continued another 11 or 12km where we caught sight of the tall Ølmåafossen near the village of Marstein. Across the valley was supposed to be Mongefossen, but we didn’t see it. The famous Trollveggen was another 7km beyond Marstein. After Trollveggen, it was another 6km to the junction of the Road 63 (leading to Trollstigen) and the E136. Another 4.3km led us right into the heart of the town of Åndalsnes where the Road 64 and E136 junctioned.